UrtheCast's customer will field a SAR satellite with shared imaging capacity for UrtheCast. Photo above depicts the Deimos-2 optical satellite that UrtheCast operates. Credit: UrtheCast. WASHINGTON — An unnamed backer of Canadian Earth observation company UrtheCast’s proposed radar and optical satellite constellation has asked for UrtheCast to develop a standalone radar satellite ahead of the rest of its constellation. 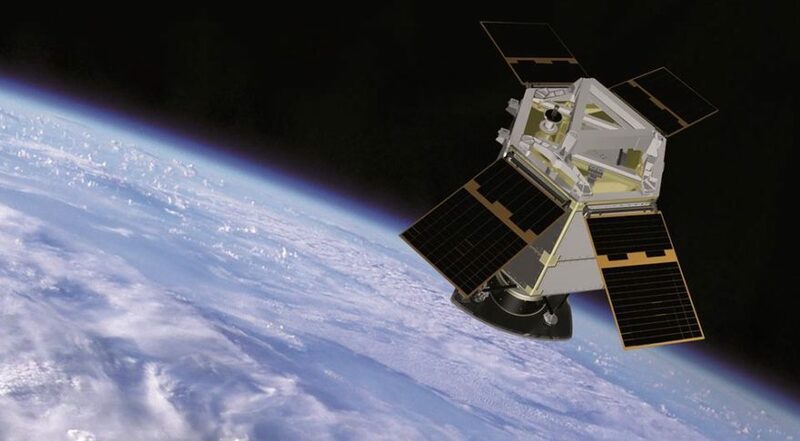 The customer signed a contract in “excess of one hundred million Canadian dollars” ($78.4 million) for a synthetic aperture radar, or SAR, satellite, including in-orbit operations support and some aspects of the ground system, UrtheCast said Aug. 14. Vancouver-based UrtheCast plans to use that satellite to pave the way for the larger constellation of eight optical satellites and eight dual-band X- and L-band radar satellites, “the date of which is now pushed out by at least a year,” to 2023, the company said. In a conference call with investors Aug. 14, Larson said the company buying the SAR satellite was one of three that had signed memoranda of understanding (MOUs) to be customers of OptiSAR once the constellation is operational. The first MOU customer, also unnamed, agreed to pay UrtheCast $180 million for the sale and shared operation of the first two satellites in the OptiSAR constellation earlier this year. The third MOU customer has also asked for a solo SAR satellite, and is currently in negotiations. “If the second contract is also successfully concluded, the plan, again subject to obtaining the necessary export control approvals by this fall, is for the two satellites to be built in tandem, starting in early 2018, and to be launched together three years thereafter, thereby providing both customers with the cost savings and programmatic advantages of building these two satellites together,” he said. Each solo-SAR customer intends to give UrtheCast commercialization rights to data collected outside their area of interest, Wade said. UrtheCast’s signed contract doesn’t include launch or insurance, according to a company statement. Larson said both customers want their individual spacecraft “in addition to their ongoing interest in OptiSAR,” not as a replacement. The second contract is “well advanced,” he said, though not yet finalized. Having SAR satellites of their own will give them data ahead of the full constellation, and give UrtheCast an additional source of revenue on top of its two Deimos satellites and two cameras on the International Space Station. “At this time UrtheCast’s management and board believe that a push-out in the anticipated or target date for OptiSAR is prudent, in large part because it reflects the reality of the situation with the customers, and also the reality of implementing standalone SAR programs,” he added. UrtheCast’s additional constellation of eight medium-resolution Earth observation satellites, called UrtheDaily, remains on track for a 2020 service start, the company said. Larson estimated that financing for the system should conclude “in the next couple of months.” Surrey Satellite Technology Limited in the United Kingdom is tasked with building both constellations. Excluding non-cash revenue, UrtheCast generated CA$11.9 million for the three months ended June 30, down from CA$21.3 million the quarter prior and CA$21 million for the same quarter last year. The company reiterated guidance for the year of CA$52 to CA$60 million, and adjusted EBITDA, or earnings before interest, taxes, depreciation and amortization, of between CA$7 million and CA$12 million.